Tetric EvoFow Bulk Fill FREE! Nano-fillers provide smoother surfaces for faster and easier high-gloss polishability, lower wear for long-lasting restorations, low shrinkage (<1.6% for better marginal integrity), and a high level of radiopacity for easy x-ray detection. Nano-modifiers layered within the resin matrix create more efficient handling properties and a more sculptable, non-slump, non-sticky consistency. Nano-sized color pigments are finely distributed within the resin matrix, intensifying color nuances. Plus, a new additive makes Tetric EvoCeram even less sensitive to ambient light and more reactive to curing lights. You get more time to model and sculpt, then a fast 10 second curing time at 1000mW/cm2. Contains: 20 x 0.2g Cavifil capsules. Contains: 1 x 3g syringe. Contains: 40 x 0.2g Cavifil capsules (5 ea. A1, A2, A3, A3.5, B1, A2 Dentin, Translucent, Bleach L); 1 Cavifil dispenser; 1 shade guide. Contains: 8 x 3g syringes (1 ea. A1, A2, A3, A3.5, B1, A2 Dentin, Translucent, Bleach L); 1 shade guide. 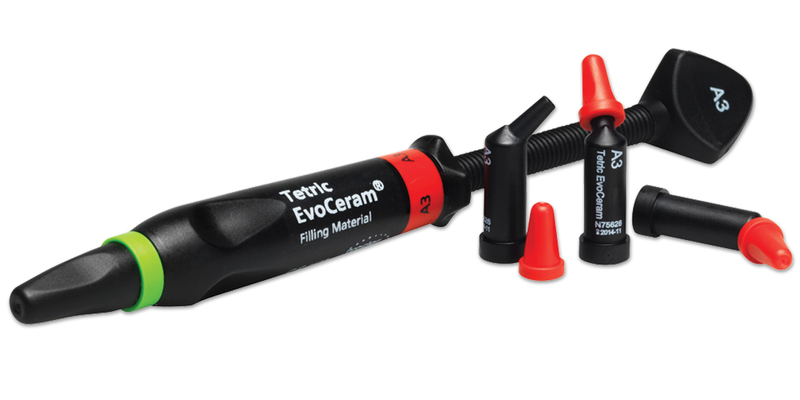 Tetric EvoCeram is a universal, nano-hybrid composite indicated for anterior and posterior esthetic restorations. The composite is radiopaque and formulated to meet any esthetic need. The Tetric EvoCeram shade range includes 22 shades offering 4 dentin, 4 bleach, 13 enamel and a highly translucent incisal shade for optimal customization. This light-cured composite incorporates well-balanced filler technology combining the advantages of all filler sizes ranging from 40 to 3,000 nm with an average particle size of 550 nm. At the 10-year recall, there were 801 restorations available for monitoring, of which 592 were recalled. The restorations included both anterior restorations (5%) and posterior restorations (95%). At recall the following categories, esthetics, resistance to fracture/chipping, resistance to marginal discoloration, and wear resistance were rated on a scale of 1 to 5 with 1=poor, 2=fair, 3=good, 4=very good, 5=excellent. Any restoration receiving a rating of 1 or a 2 in a category was replaced. Restorations receiving a rating of 3 or 4 in a category were considered clinically acceptable. Resistance to Fracture/Chipping: More than 94% of the 592 recalled Tetric EvoCeram restorations received an excellent rating based on resistance to fracture and chipping. Fifteen restorations (2.5%) had minor chips and received ratings of 3 or 4. These restorations were either smoothed or repaired with flowable composite. Twenty restorations (3.4%) were replaced as a result of tooth fracture and/or recurrent decay – not due to composite failure. Esthetics: The esthetics of Tetric EvoCeram were excellent. Of 592 recalled restorations, 92% received an excellent rating and close to 8% received a good to very good rating. Only two restorations required replacement because of poor esthetics. Tetric EvoCeram layered with a translucent shade often resulted in improved esthetics. Resistance to Marginal Discoloration: Eighty-six percent (86%) of the recalled restorations had no visible marginal discoloration and were rated excellent. Of the remainingrestorations, 12% had slight to moderate marginal discoloration requiring no intervention, while 2% had excessive marginal discoloration that necessitated their replacement. Both the composite and the bonding agent can affect marginal discoloration. A variety of bonding agents were used, with approximately 89% being self-etch and the remainder total-etch bonding agents. Excessive microleakage can lead to caries. Wear Resistance: 97% of the restorations received a rating of excellent and showed no evidence of wear. Only 12 (2%) restorations had slight to moderate wear, requiring no intervention. Four restorations had excessive wear that resulted in their replacement. This 10-year evaluation of 592 restorations demonstrated that Tetric EvoCeram had superior performance in esthetics, resistance to fracture/chipping, resistance to marginal discoloration, and wear resistance. Tetric EvoCeram has excellent handling characteristics. It is non-slumping, not sticky, contours well, and is easy to finish and polish. Tetric EvoCeram received a 97% clinical performance rating.